The most cruel thing that can happen to a writer is total Writer’s Block. It is, for a writer, worse than having one’s hands chopped off. Even with no hands, one can always dictate words to a person or a computer, but the dreaded Block steals the very core of the process. Fresh ideas from the “little gray cells,” as Hercules Poirot would say, are our stock in trade. What overlays the ideas is merely clever storytelling and ornamentation. In other words, most of us who claim to be writers (and yes, I’m including myself) are essentially windbags just talented enough to expound on any germ of an idea until it becomes apparently richer or more entertaining, and thus “worth reading.” Steal our inspiration, dampen our creative wool, burn our stockpile of ideas tucked away for future use, and suddenly we are left with nothing to expound upon. We become, in our own minds, blasé. It’s a horrifying prospect for us egotists. This happens to me from time to time. My little muses evaporate with a change in my mood, and with them go the blog, the chatty emails I sometimes write to friends, and my best record of who I am at the moment. It’s an awkward feeling. What I write defines a large part of who I am. Without writing for a while, I begin feel like I am leaving no impression on the world, I’m just taking up space and waiting for something to happen. Which isn’t really true of course. I know I have a bigger footprint than just these little Internet scribbles. But writing has become such an outlet and important process for coalescing the thoughts in my head that it has become essential to my daily life. It’s just like the person who runs daily, and pines when injured and unable to gain the happy endorphin feeling. That little bit of exercise (whether mental or physical) becomes the key to a well-balanced perspective on all other things. Your behavior is parallel to the withdrawal syndrome from opiates, ethyl alcohol, or nicotine. You can’t control the impulse. You must first acknowledge that you have a problem; somewhere in the vast expanse of southern AZ is a blognot support group. Looking back I can see (sarcastic comments aside) that writing has been my lifelong habit. Even in high school and college I had a fantastic IBM Selectric II that I loved to use to type out long letters. It had the most marvelous keyboard action, just tap a key, feel the “click” of the button, and watch the powered type ball leap up and smack the paper assertively. Typing on it was an industrial symphony: the electric motor hummed like an air conditioner and a faint smell of warm machine oil would waft out of the innards, and the ball would flick around whacking the paper with precision and unflappability. You could never type fast enough to jam it, which was in itself enough reason to love the machine after using any manual typewriter, but the IBM was more than just a better mousetrap; it was one of those incredible machines that came out of the slide-rule era of engineering. Like the thrice-supersonic SR-71 (the fastest aircraft ever made, even today), it represented the pinnacle of what brilliant engineers could do with paper and brains, long before there were CAD stations on every desk. The Selectric II, and the kludgy ASR-33 TeleType that taught me how to type before that, were tactile and thunderous and they made me feel like I was doing something with every punch of a key. Now, thirty years later, I type on nearly silent plastic keys, and the letters jump up in a virtual space. It lacks the apparent permanence of paper and ink, but the ideas presented here really have a shelf life considerably longer than the letters from my Selectric. Those letters are — for the most part — lost. At least here on the Internet there are a few people who will read the words, and the essays are retained by anonymous computers for me to reference someday in the future. That is the gift of the Internet to frustrated writers everywhere. We must communicate or die of mental constipation. Here we can be guaranteed of publication, regardless of the opinions of obstructionist editors and publishers. Even though I am both (and hence can approve publication of my own screed) I take full advantage of the Internet as an alternative outlet. And more than that — I take advantage of the Internet as a way to break the curse of Writer’s Block. See, when I began this essay I had absolutely nothing to talk about. For days I’ve been opening up the WordPress blog software and staring at the blank screen, then closing it again a few hours later. So I finally wrote just two words: “Writer’s Block” and let you, my friendly readers, be the inspiration. It’s a partnership we have, you & I. Thanks. Being former Vermonters, we are inclined to believe in perennial traditions such as late winter harvesting of maple sap, April snowfall, and the fall county fair. Where in more urbane settings the county fair might be considered a hokey and archaic gathering of yokels and hooligans, Vermonters know that the county fair is one of those places where you can count on meeting your friends and seeing their children proudly displaying the heifers they raised from calves. Rather than being an opportunity to eat fried Twinkies and shop for hot tubs, the Vermont county fair is an occasion for adults to exchange sociable greetings between the display of New Holland tractors and the 4-H tent. For kids, the attractions are more basic. Sugary sweets (cotton candy, funnel cakes, flavored ice) and rides that spin your head off are the reason to go. We adults pretend to tolerate this because we want our children to grow up to appreciate the finer aspects of the county fair later, but in reality we still wish to recapture the simple thrill of the midway and its colored lights, barkers, and rigged games as remember them from our own childhoods. By holding the hand of an excited child tugging our way to the Tilt-A-Whirl, we can at least touch the memory briefly. So once in a while, we take Emma to the county fair. 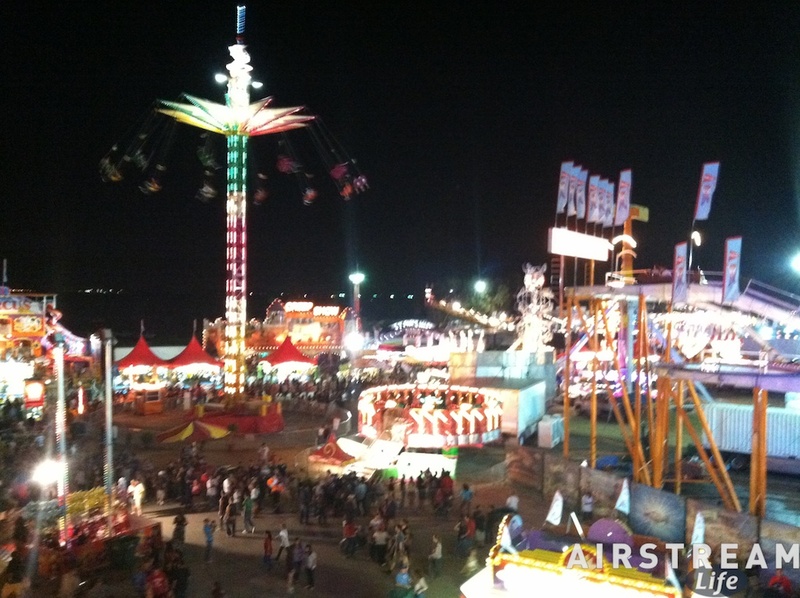 Here in Arizona, the season is upside down in an attempt to beat the heat, with the Pima County Fair happening in April rather than the traditional northern schedule of August or early September. This disconcerts us a bit, because we associate the fair with the coming of pick-your-own apple season, and the quickening of chill in the evenings. The ground should be damp from the last of the summer thunderstorms, and hearts should be bittersweet with the knowledge that the preponderance of summer is gone but a last thrill awaits. Dusty air and a sense of intense sun are the hallmarks of an Arizona county fair; after all, the heat of summer is just around the corner. In a month we will hit 100 degrees for the first time and, as they say locally, the ice will melt in the Santa Cruz River. (That is definitely a tongue-in-cheek statement, since the Santa Cruz bears no surface water for much of its length and ice is only found in drinks around here.) So here the County Fair represents the impending turn of seasons, as snowbirds flee and Arizonans call for their annual air conditioning checkups. County fairs come in all sizes and persuasions, from the tiny Stalwart County Fair (Michigan) that features agricultural exhibits and not much else, to the extra-large events in major urban areas that are primarily a mix of rock concert venue and carnival. 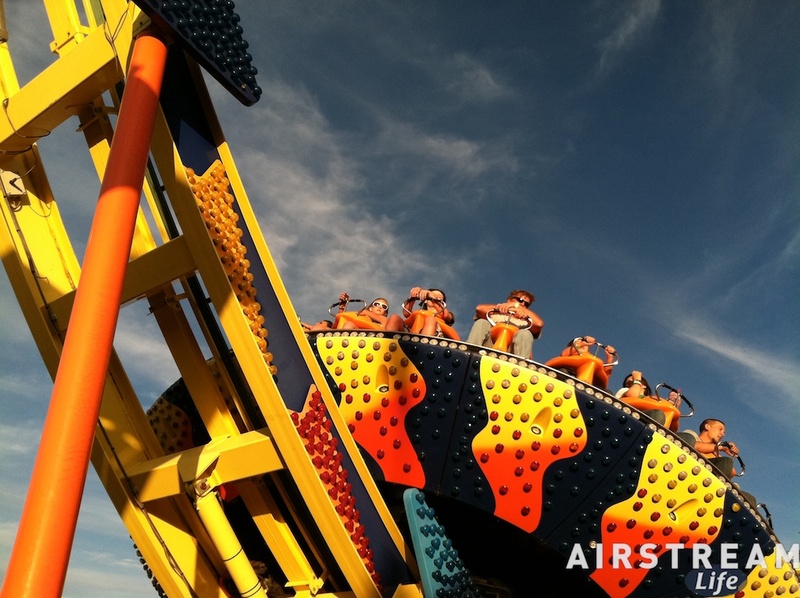 A nearly-universal attraction of modern fairs, however, are the rides: slides, coasters/flumes, spinners, and drops are the basic tools of the amusement park ride developer, and once in a while you can mix up a few elements to come up with something like the “Disk-O” (above). There is little that can be called new, but then love is nothing new and yet people still practice it. In the section of the park that is oriented to big kids and childish adults, the rides are almost always the same as I remember from my childhood but with louder music and stranger airbrushed graphics. The spinning “Himalayan” that Emma loves is called the “Rave” here, and it features a giant King Neptune as disk jockey wearing sunglasses and an audio headset. On a nearby ride I see airbrush art of clowns bearing machine guns. Nothing makes sense but it all somehow fits in an absurd, Alice-In-Wonderland sort of way. The aluminum handrails of the “Moscow Circus” are sticky with thousands of hands that have recently been handling greasy corn dogs, gooey nachos slathered in cheese, pizza slices, turkey legs, funnel cakes, and deep-fried Snickers bars. I think about handwashing or applying Purell, Emma thinks, “Let’s go again!” — and the adult part of me fades away, the child wins out, and we go again, and then find another ride until the sun has long been behind us and the lights of the fair have come on to create a new world that bears exploring yet again. You can’t compete with that sort of magic, and pretending it isn’t there is a very “adult” thing to do, which in kid-speak means stupid. Just let it wash over you, because escapism is something most of us don’t practice often enough. I think the best aspect of the county fair is its transience. It happens only a few days each year, and then it slinks away on trucks to find a home elsewhere. You have to participate when it is ready, like eating a chocolate chip cookie hot out of the oven. Wait a little while and the little chips aren’t melted anymore. Wait a few days, and they’re gone. This small window of opportunity forces you to rise up out whatever doldrum you may be feeling and taste the experience at its very peak, which is a good lesson for all of us. Life doesn’t wait, any more than the county fair does. I’m back in Tucson, trying to digest the myriad events of the past week. I ventured out to Texas with an agenda: to seek diversity, new input, and ideas from the friends I met along the way. Well, I got a lot more of that in a short time than I had bargained for. Now, instead of being refreshed, I feel as though I have eaten too much of a smorgasbord. I need a mental Alka-Seltzer and a few days to get everything processed in my brain. 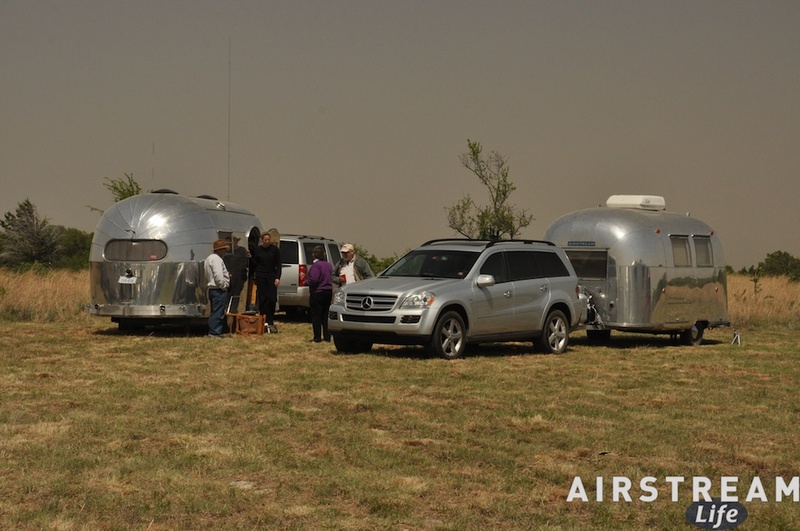 The Lone Star Vintage Airstream rally was pleasure, despite the tremendous trailer-rocking winds on Friday and the awareness that wildfires were sparking up all over Texas. Since we were parked in the midst of 20,000 acres of dry grasslands, one good fire could have swept over us and wiped out 40 or so lovely vintage Airstreams — not to mention the occupants. I never heard anyone speak of this possibility, but I’m sure many of us had it on our minds. Like the devastating effects of a hailstorm on aluminum, it’s one of those things you’d rather not contemplate. Saturday was quite a bit nicer, with calmer winds and fine skies for the Open House, where everyone browses everyone else’s trailers. On Sunday morning, it was time for me to go. The Caravel was destined for Paradise — Paradise, Texas, that is — where my friend Paul Mayeux has his fledgling Airstream workshop. 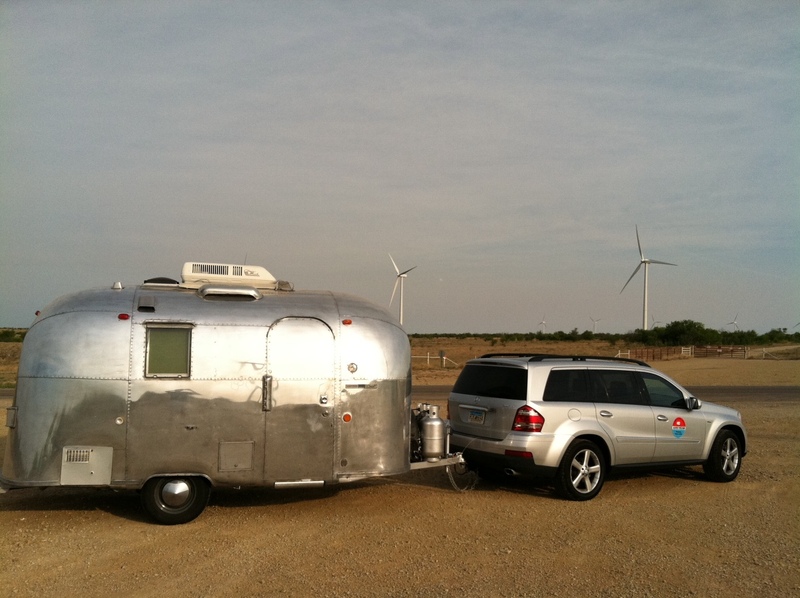 We have visited Paul and Ann many times over the years, usually when we are in nearby Weatherford getting serviced at Roger Williams Airstream. Now that Roger Williams has ceased being a dealer and service center (at least for now), we are happy to patronize Paul’s new shop. He’s got a list of little tweaks that I want on the Caravel, and will be working on it in May. Dropping off the Caravel meant I needed to empty out all the leftover food Eleanor had sent along with me, as well as personal items that I’d want back at home or when we go out in the Safari later in May. I cleaned the trailer, stripped out all the food and tossed it in the Mercedes, left the fridge open to air out, shut off the propane, installed the hitch lock, and then, rather wistfully, drove off for the first time in five days sans Caravel. While I love the fact that Eleanor prepared food and treats for my trip, I had far too much to consume during the rally, even though I was sharing the food at the potluck breakfasts and dinners. The rest of my trip became a mission to somehow get rid of everything perishable before returning to Tucson. I stopped off and bought a large cooler and four ice packs, and immediately began plotting ways to force my friends to eat. Normally this isn’t a problem, but the leftovers were not exactly designed to go together: Indian dal, a sheet of brownies, cranberry-almond cake, yogurt, various cheeses, Italian sausage, apples, some bread rolls, etc. 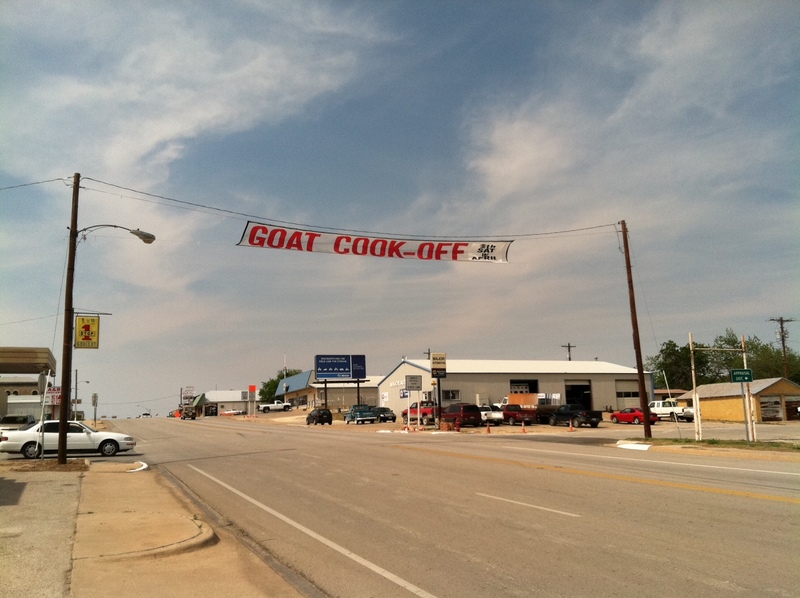 I could see it was going to take some convincing to get beef-eating Texans to engage this odd little picnic. Fortunately, my first stop was at the home of Erica and Jef, who took the plunge and discovered something new that they would never be able to find in their little Texas town, namely the dal. We cut up the blue and gouda cheeses and the dry Italian sausage to eat with stoned wheat crackers, and tried the brownies and cake for dessert. All in all, it went well from a culinary perspective but I was still left with quite a bit of stuff, so after a very peaceful night in the 1948 Airstream Trail Wind I gathered up my ice packs from the freezer and hot-footed it down I-20 to my next stop. Marty & Nevena live in El Paso in a converted movie theater that they have owned for over twenty years. Marty uses the place as his studio (he’s a photographer) but also as a base for their magnificent vintage trailer collection. The interior of the structure defies description, as it is one of the most eclectic homes I have ever visited. Two decades of customizing the building with their unique artistic bent, and collecting all sorts of things has resulted a place that is something like a mashup of a mid-century modernist art museum and an architectural fantasy. I loved being there, and fortunately, they loved the brownies enough to keep the rest of them. 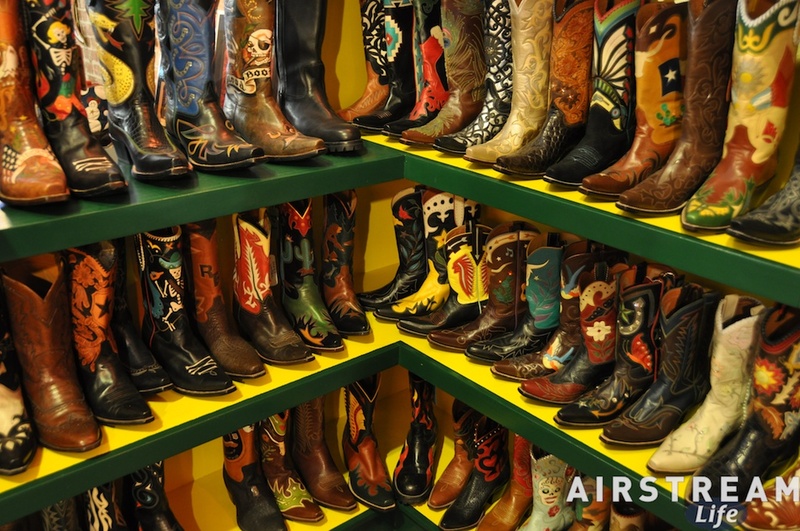 Marty & Nevena also run a business called Rocketbuster Boots, which makes absolutely spectacular custom cowboy boots. Every pair is made to order (the ones on display are samples), and if you want a pair, be prepared to pay for the privilege of wearing a fantastic set of handmade boots with absolutely anything you want on them. They are really art, and I almost wonder how anyone can justify even wearing these beautiful boots. If I had a pair I’d probably keep them under glass. Although I’d met both Marty and Nevena at the Palm Springs Modernism Show last February, I hadn’t had much time to talk to them until my visit. They turned out to be a remarkable couple with great insight and peacefulness about them. This morning Marty and I sat in the dining room eating chili bagels and drinking tea after Nevena went to the boot shop, and discovered that we have a remarkable amount of philosophical common ground. After an hour he had me almost convinced to go looking for my own open space commercial building (like a firehouse, church, or schoolhouse) to live in and start collecting vintage trailers again. From Tucson to Decatur TX and back is about 1,800 miles of driving. Add in the late-night sidetrip to Austin to pick up the ’55 FC and a detour to Paradise, and the total mileage easily exceeds 2,000 miles. Four different overnight locations in seven days, too. The trip was a crazy whirlwind of events, places, emotions, and ideas, so as the untethered Mercedes was thundering east on I-10 on the final leg, I began to feel that it all needed to be put into some sort of context. The trip wasn’t relaxing for the most part, but it was challenging and inspiring, and sometimes that’s what I need. So my brain began spinning. I shut off the iPod music and spent the rest of the 300 mile drive from El Paso to Tucson talking on the phone about new ideas, and new plans for the coming months. Nothing will come of it quickly or easily, but I can credit this strange and wonderful adventure for pushing me to plant some seeds today. As the rest of this Airstream trip meanders through my mind, more changes and directions will probably float to the surface. I will be interested to see how the “summer garden” of new ideas begins to shape up. But first, it’s time to unpack the cooler. I just realized that I haven’t attended a rally as a camper in about two years. There was a time when we were frequent rally-hoppers, attending events all over the country, but gradually our participation became less. I can’t say why, exactly. It just seems to be a natural evolution of our priorities, and perhaps a reflection that over time I’ve become less of an attendee and more of an organizer. 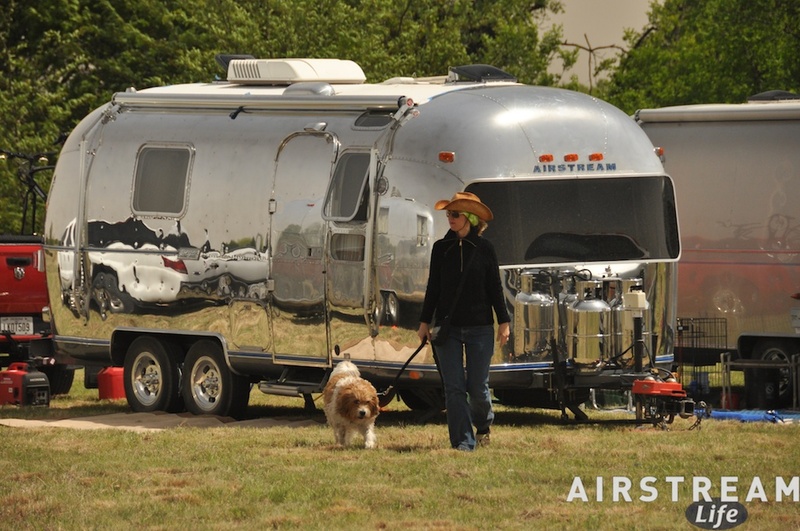 The gathering of Airstreams here in the LBJ Grasslands has been in many ways a classic “vintage” event. 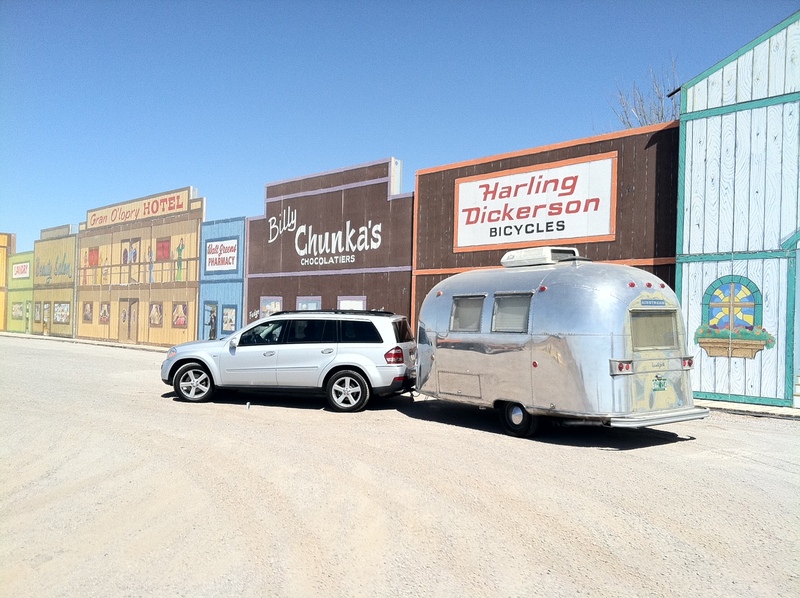 All of the common elements that I remember from earlier years are here: a wide assortment of old Airstreams, relaxed and generally happy owners eager to socialize, and a particular emphasis on shared meals. Our site is a rough-mown section of grasslands, atop a point of land with a moderately panoramic view and exceptional privacy. The road leading in is gravel and dirt, and only one lane wide at spots, which contributes to a sense that you have arrived somewhere well away from the hubbub of the world. A multi-use trail passes by (largely occupied by horses), otherwise there are no facilities whatsoever. What we have brought with us in our Airstreams is all we will have for the days we are here. Fortunately that’s no problem. Eleanor made sure that the Caravel was packed full of food both for my meals and to contribute to the potluck dinners that have been planned. Even though this trailer is smaller than the one we usually use, it has almost all the same amenities — and everything you might need, in less space. Occupying yourself at an event like this is easy. There’s always someone who wants to talk, or show their trailer off, or see yours. In between, I usually find time to read, write, nap, or contemplate. It can be exceptionally relaxing, especially in a location such as this where modern distractions are kept at a distance. I didn’t really expect to find many “newbies” here, but I brought five copies of the new book anyway, and it didn’t take long to find people who needed them. Most of the people here are very experienced, and in fact 13 couples attending are people we’ve camped with before, or at whose houses we’ve courtesy parked. 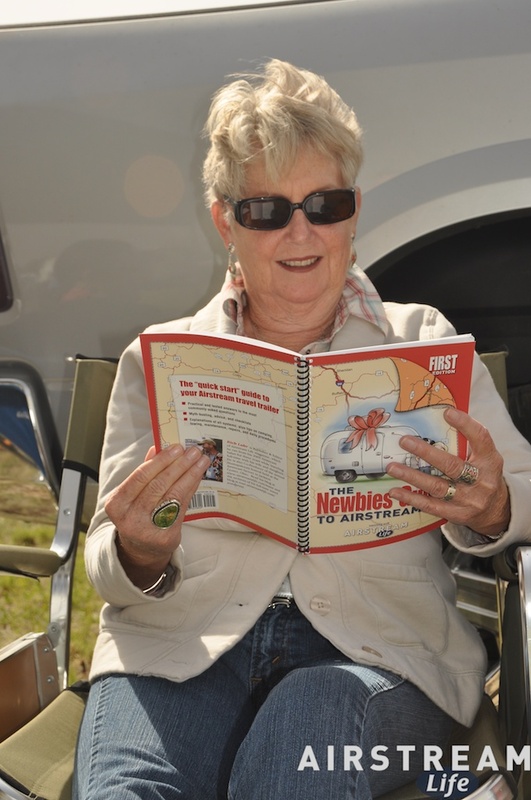 But there are always new people entering the vintage Airstream community, and being at an event like this is a great way for them to get up the learning curve quickly. Being on the fringe of the civilized world does have one disadvantage to me at the moment. Cellular phone service is iffy here, and I’m not able to get photos to upload to the blog tonight. But once I’m back in the world I’ll update this blog with several pictures of the scene, and perhaps a few more thoughts on the day. When I travel solo, things are very different. The travel gets more gritty, as I usually press on to keep engagements and keep a schedule that fits only me; my Circadian cycle, my inner motivations, my concerns. This means I take things as they come, and I rarely pause for long. It was 600 miles of towing to Midland, TX on Tuesday. The I-10 route through Arizona, New Mexico, and west Texas is old territory now, an startlingly bleak landscape interspersed with a few cities like El Paso and Las Cruces. I still like driving it, because with familiarity the small landmarks and quirks of leftover western history pop out at me as I go, and they keep me entertained. Plus, there’s the sheer thrill of America’s most wide-open spaces. Crank up the turbodiesel to 70 MPH and just let ‘er fly — the Caravel will happily follow, being light as a kite and beautifully stable. No traffic except for a few minutes in El Paso. Put on the iPod and sing along. I laid there, sleepless. I responded to a few emails, make a list of things to fix on the Caravel, thought about my route for the next day, read a book. Finally at 11:30 p.m. I felt more awake than I had been all day, and so it seemed inevitable that I give in to whatever what driving me. I put everything away, jumped in the car, and drove another three hours in the dark with the long-haul truckers on I-20 to Abilene. At 2:30 a.m. I landed at a Wal-Mart and finally felt like I could get some sleep. I pulled in near a bunch of trucks and slept until about 7:30. At this point I was far ahead of my schedule. It was a good chance to contemplate the Caravel, and consider options for the day ahead. It was also a prime opportunity to test the improved boondocking capabilities of the trailer before I went to the vintage campout this weekend. For example, Eleanor had modified the shower curtain to eliminate some annoying leaks that previously caused puddles on the floor, and my Wal-Mart-parking-lot shower test proved that the fix was good. As I’ve been traveling I’ve been posting short updates via Twitter, just as an experiment. The photos in today’s blog are part of that experiment — all of them were taken with the iPhone and posted to Twitter as I traveled. My stay here was arranged a fellow Airstream enthusiast, who invited me to take a trip down to Austin to go inspect and possibly buy a sweet 1955 Flying Cloud. How could I say no to that? So after about 800 miles of driving in 36 hours, we were off for a 2.5 hour drive down to Austin … which culminated in buying the Flying Cloud and towing it back (after a quick streetside re-wire of the 7-way plug, in the dark). 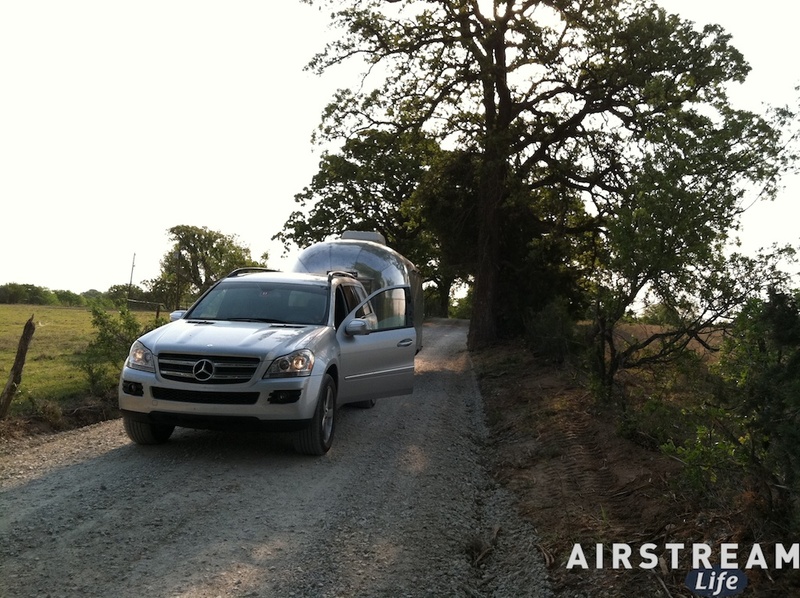 We dodged deer all the way back along the lonely 2-lane highways of rural Texas, and it was 2:30 a.m. when I finally got back to the haven of my Caravel and a chance for desperately-needed sleep. Gritty, challenging, sleepless — yes, but never boring. This is how I roll sometimes. There are a lot of interesting people in the world, and a lot of interesting things to do. I guess I’ll find time for resting a little later.